Donald Smith was born on June 7, 1935, in Prairie City, Oregon. He enlisted in the U.S. Air Force on April 10, 1954, and after completing basic training, he was trained as a Survival Training and Personnel Equipment Specialist at Chanute AFB, Illinois. His first assignment was as a survival training & personnel equipment specialist with the 3635th and 3636th Combat Crew Training Squadrons at Stead AFB, Nevada, from December 1954 to February 1958, followed by Fuel Supply Specialist training at Keesler AFB, Mississippi, from February to May 1958. Sgt Smith served as a fuel supply specialist with the 3242nd Maintenance Squadron and the 4135th Strategic Wing at Eglin AFB, Florida, from May 1958 to February 1959, and then with the 389th Support Squadron and the 389th Strategic Missile Wing at F.E. Warren AFB, Wyoming, from March 1959 to April 1963. He then attended Rescue & Survival Technician training before serving as a Pararescueman with the 54th Air Rescue Squadron (later redesignated the 31st Aerospace Rescue & Recovery Squadron) at Goose AB, Labrador, from November 1963 to March 1965, and then deployed to Clark AB in the Philippines from March 1965 to April 1968. During this time, Sgt Smith deployed to Vietnam from April 1965 to August 1966. His next assignment was as a Pararescueman with the 305th Aerospace Rescue & Recovery Squadron (ARRS) from September 1968 to July 1969, followed by service with the 37th ARRS at DaNang AB, South Vietnam, from July 1969 to June 1970. 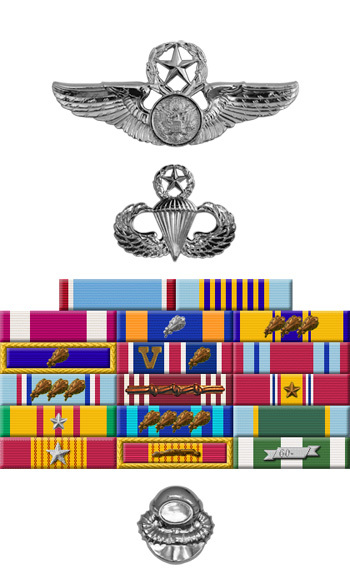 Sgt Smith served as NCOIC of Pararescue Standardization with Headquarters Aerospace Rescue and Recovery Service at Scott AFB, Illinois, from June 1970 to May 1971, and then served as a Pararescueman with the 48th ARRS at Fairchild AFB, Washington, from June 1971 to February 1975. His final assignment was with the 3636th Combat Crew Training Wing at Fairchild AFB from February 1975 until his retirement from the Air Force on June 1, 1976. 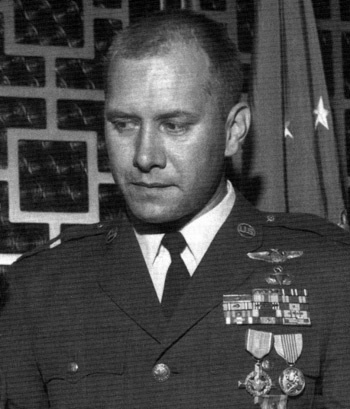 The President of the United States of America, authorized by Section 8742, Title 10, United States Code, awards the Air Force Cross to Technical Sergeant Donald G. Smith for extraordinary heroism in military operations against an opposing armed force as a Pararescueman on a HH-3E Rescue Helicopter in Southeast Asia on 24 October 1969. On that date, Sergeant Smith voluntarily descended to the surface on a forest penetrator to assist a downed pilot. As he and the pilot were being raised, hostile fire rendered the hoist inoperative and the cable was sheared, dropping them fifteen feet to the ground. Sergeant Smith's position was surrounded by hostile forces, and his helicopter was downed by hostile fire. Remaining exceptionally calm, his resolute and decisive presence encouraged other survivors, while his resourcefulness in controlling and directing the aircraft providing suppressive fire, resulted in the safe recovery of all downed personnel. Through his extraordinary heroism, superb airmanship, and aggressiveness in the face of the enemy, Sergeant Smith reflected the highest credit upon himself and the United States Air Force.